When Olivier Messiaen (1908-1992) completed the vast opera Saint FranÃ§ois d’Assise in 1983, he was mentally and physically exhausted, and believed that this monumental work would be his final compositional statement. In fact, he completed seven further works, and these form the focus of the present study. 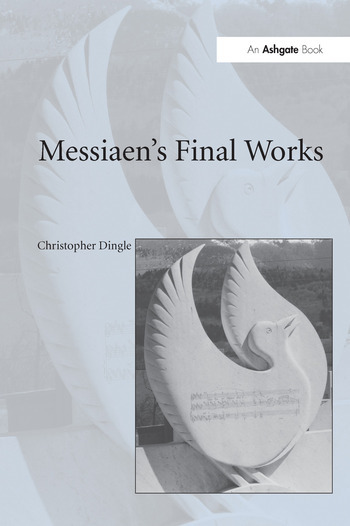 Christopher Dingle suggests that, following the crisis provoked by the opera, Messiaen's music underwent a discernible change in style. He examines these seven works to identify characteristics of the composer's music, in particular an often overlooked aspect of his technique: harmony. Part I of the book begins with a brief historical survey before discussing Saint FranÃ§ois d’Assise as the work which defines everything that follows. Part II examines the series of miniatures that came after the opera and their links with Ã‰clairs sur l’Au-DelÃ ..., his final masterpiece. Ã‰clairs forms the subject of Part III of the book. Each movement is analysed in turn, before the work is considered as a whole and its hidden structure and motivic cohesion is revealed. Finally, Part IV considers the incomplete Concert Ã 4 and key stylistic features of the works of Messiaen’s final years. Contents: Part I Final Works: The end; A few techniques from Messiaen’s musical language; Messiaen’s final work? Saint FranÃ§ois d’Assise; Messiaen’s final (organ) work: Livre du Saint Sacrement. Part II The Miniatures: Introduction to the miniatures; A work for Yvonne Loriod: Petites Esquisses d’oiseaux; Two works for Boulez: Un Vitrail et des oiseaux pour piano solo et petit orchestre and La Ville d'En-Haut pour piano solo et petit orchestre; A work for Mozart: Un Sourire pour orchestre; A work for Alfred Schlee: Pièce pour piano et quatuor Ã cordes; The miniatures: an overview. Part III Ã‰clairs sur l’Au-DelÃ ...: Introduction to Ã‰clairs sur l’Au-DelÃ ...; I. Apparition du Christ glorieux; II. la constellation du Sagittaire; III. l'Oiseau-Lyre et la Ville-Fiancée; IV. les élus marqués du sceau; V. Demeurer dans l'Amour...; VI. les sept Anges aux sept trompettes; VII. et le Dieu essuiera toutes larmes de leurs yeux...; VIII. les étoiles et la Gloire; IX. plusieurs oiseaux des arbres de Vie; X. le chemin de l’Invisible; XI. le Christ, lumière du Paradis; Ã‰clairs sur l’Au-DelÃ ...: fundamental harmonic structure, developments of themes and overview. Part IV Final Thoughts? : Death and a new work: Concert Ã quatre pour flÃ»te solo, hautbois solo, violoncelle solo, piano solo et orchestre; Messiaen’s latest style; Appendices; Select bibliography; Discography; Index. Christopher Dingle is Reader in Music at Birmingham Conservatoire, UK. He is the author of the acclaimed biography The Life of Messiaen (Cambridge University Press), co-editor of Olivier Messiaen: Music, Art and Literature (Ashgate) and is editing, with Robert Fallon, two further collections of essays, Messiaen Perspectives 1: Sources and Influences and Messiaen Perspectives 2: Techniques, Influence and Reception (both Ashgate). He is also editing The Cambridge History of Music Criticism (CUP, forthcoming) and is a member of the review panel for BBC Music Magazine.